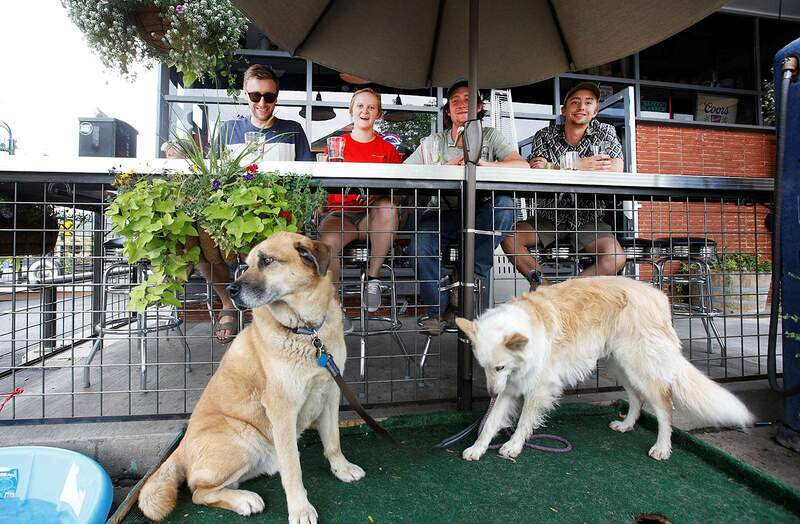 Dog lovers, from left, Matt Leach, Sarah Trask, Harrison Hopkins and Jack Burk enjoy a meal with various pups in tow at 11th Street Station, which conveniently placed a puppy parking lot near a bench table just outside the patio. Trask’s dog, Kenosha, a collie-mix, is on the right, and Burk’s dog, Ziggy, “a full-bred mutt,” is on the left. Sarah Trask and her pal Kenosha, a collie-mix, have found their downtown spot: 11th Street Station – where Trask can nibble and Kenosha can chill at her feet at a puppy parking lot provided by Durango’s new gathering place for food trucks. Durangoans are known as dog lovers, and tourists, picking up on that, are often arriving in town with pooches in the passenger seat. When it comes time to fill hungry bellies, whether locals’ or tourists’, restaurants that are dog-friendly are more frequently rising to the top of the list. “I’m actually surprised there aren’t more dog-friendly places in Durango because the trails are so dog-friendly,” Trask said. In the Denver-area, where Trask comes from, she said it’s more likely than not that a restaurant’s private patio will allow dogs, but in Durango, she thinks the opposite is true. “In Denver, almost all restaurants with an outdoor patio are dog-friendly,” she said. It turns out getting the OK to allow dogs on private patios is not as easy as a phone call and a quick visit to a government office. San Juan Basin Public Health reviews variances for pets on patios, but the Colorado Department of Public Health and Environment is the authority that grants acceptance or denial of the variance. Tammy Buckley, who purchased Cyprus Cafe in May, said getting approval to allow dogs on her outdoor patio was at the top of her to-do list. Still, she spent three months working to get the variance. Write a report about why the restaurant should get a variance and explain a financial burden from lost business.Provide pictures and diagrams about the layout of the business to ensure dogs would not come into contact with the kitchen.Describe training of employees and how putting dogs on patios would be done.Describe the supplies used and how they would be obtained.Now that dogs are allowed on the patio, Buckley has to ensure employees use a separate back station to wash dog bowls, and employees have to follow specific rules and use specific cleaning agents in daily patio cleanings. For 23 years, Cyprus had allowed dogs on the patio, but Buckley said San Juan Basin Public Health insisted the restaurant go through the variance process this year before dogs could return to the patio. Megan Smith often takes, Gordie, her daughter’s service dog, to Homeslice Pizza, where owners have obtained a variance to allow dogs on the outdoor patio. Megan Smith and her dog, Gordie, which serves as an emotional-support service dog to her 12-year-old daughter, Lael, often chooses Homeslice Pizza on north Main Avenue because its patio is dog-friendly. Dylon Harrison, manager at Homeslice on north Main, said Smith is exactly the person the pizzeria’s dog-friendly policies are aimed at: neighborhood residents who have been separated from their dogs all day and are looking for a place to unwind at the end of the day with their four-legged pal. “We’re all dog lovers here, and the owners have a bunch of dogs. It’s just nice for the neighbors that they can come here after a tough day and bring their dogs and hang around,” Harrison said. Homeslice’s patio has signs welcoming customers and their dogs; it provides not only water bowls but leashes, waste bags and cleaning mitts. Durango isn’t shy about touting its cynophilist tendencies. The Durango Area Tourism Office has a webpage that introduces mascot dogs of various Durango businesses, and the Durango Business Improvement District has a webpage with the five best spots to dine with your pooch. Under state rules, dogs on patios must be kept on leashes, kept close to their owners, be up to date on vaccinations and they cannot misbehave. Restaurant employees can ask customers with misbehaving dogs to remove them. Service dogs are an exception to state rules barring access to canines in indoor dining areas, but restaurant employees can remove misbehaving service dogs as well. Smith said dog owners should be responsible enough to take only well-behaved pets to restaurants. Her experience is that dog owners are mature enough to handle problems if incompatible dogs are placed too close to each other. Since May, when dogs returned to Cyprus Cafe’s patio, Buckley hasn’t had one problem dog. “At one point, we had a dog at every single table, and it was fine,” she said. Employees seat people on the patio with an idea to minimize dog-related disruptions, Buckley said. But dogs, she said, no matter where they’ve been placed, have remained model customers. 11th Street Station does not allow dogs on its main patio, but the Main Avenue restaurant’s two puppy parking lots seem to meet customers’ needs. From left, Matt Leach, Sarah Trask, Harrison Hopkins and Jack Burk have a meal with Trask’s dog, Kenosha, right, and Burk’s dog, Ziggy. Marcos Wisner, co-owner and general manager of 11th Street Station, said when opening an eatery with so many outdoor seats, he knew customers would be coming with dogs. And while dogs are not allowed on the main patio, he said the business’s two puppy parking lots seem to meet 11th Street’s needs. “We have thought about applying for a variance (to allow dogs on the main patio), but what we have now seems to be working well, and it’s handling our needs,” he said. “When we first opened, it was a little overwhelming dealing with the dogs, but we put up signs, and now people seem to get the idea of how things work,” he said. 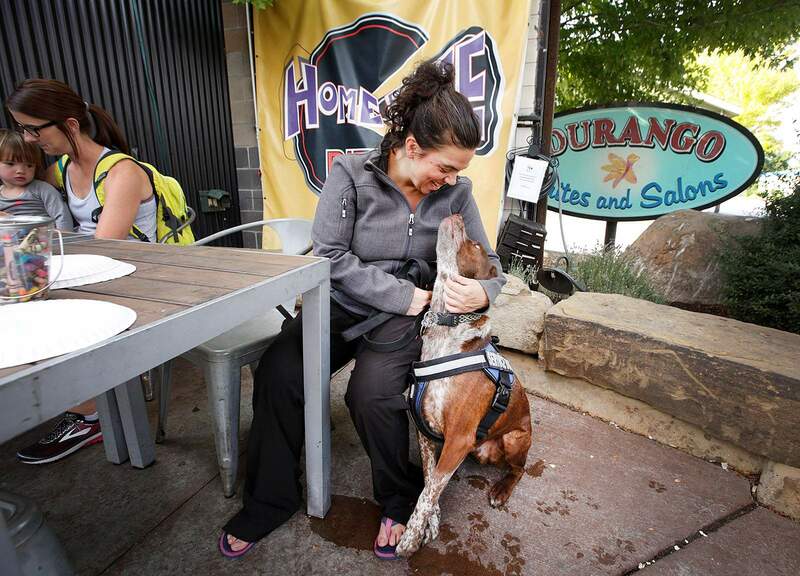 So far, Durango has two restaurants – Cyprus Cafe and Homeslice, both north and south locations – that have obtained variances to allow dogs on their own private patios. Currently, like many other restaurants, Grassburger allows dogs just outside its patio on the sidewalk, a similar setup to 11th Street Station. 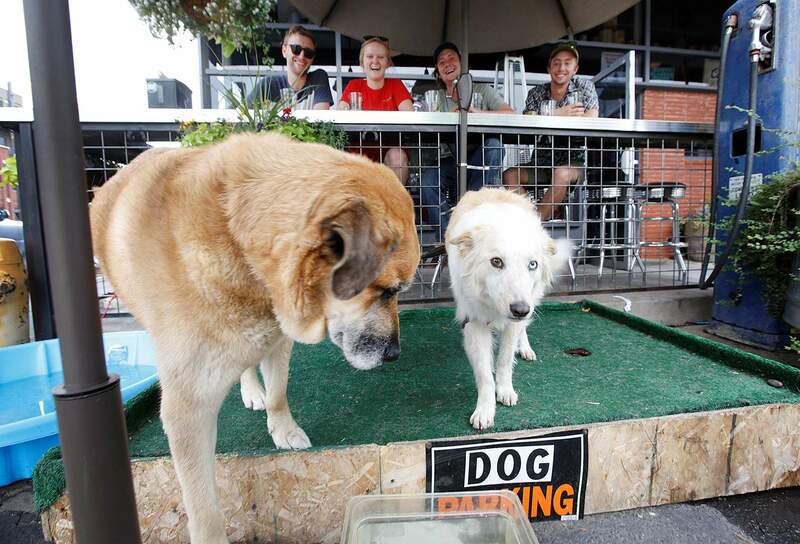 But Grassburger may be the third Durango establishment to allow dogs on its private patio. General Manager E.J. Romero said the kitchen manager has begun working with the health department to get a variance to allow dogs on its outdoor patio. “We’ve been working on it for four months,” Romero said. parmijo@durangoherald.comThis story has been updated to reflect the fact that San Juan Basin Public Health reviews variances for pets on patios, but the Colorado Department of Public Health and Environment is the authority that grants acceptance or denial of the variance.